Seth Burres of Delta drives along the baseline during a game last season. He is a returning letter winner for the Panthers in 2018-19. There are some things to like about the Delta boys basketball team in 2018-19. However, with new leadership under first-year coach Derek Sheridan, time will tell how competitive they can be. Sheridan brings experience to the job, most recently at Maumee where he coached from 2008-17. He was also a coach at Washington Court House and in Indiana. The Panthers return three letter winners, two of whom were starters a year ago. Their main returnee is Brady Wymer who was honorable mention All-Northwest Ohio Athletic League and in District 7. Seth Burres is the other returning starter while Jarod Kurfiss is back as well. Newcomers to the squad are Ashton O’Brien, Jacob Schneider, Hunter Tresnan-Reighard, Joe Durfey, Braden Risner, Hunter Hamilton, Lane Oyer, Mike Eckenrode and Josh Tresnan-Reighard. “Strengths could potentially be teamwork and rebounding,” stated Sheridan. 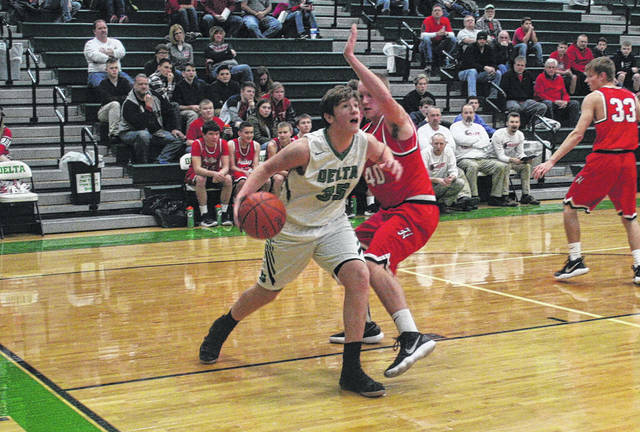 But, there will be some holes to fill with the loss of players like Bowen Green (second team All-NWOAL, honorable mention District 7/Northwest District) and Gabe Freeman (honorable mention All-NWOAL). And with having to adjust to a new coach. “Players are learning new offensive and defensive systems – the team’s level of execution needs to improve throughout the season,” said Sheridan of potential weaknesses for the Panthers. The new coach thinks his Panthers can finish near the middle of the NWOAL. He has them at fifth in his preseason poll behind Archbold, Wauseon, Bryan and Evergreen. Delta travels to Pettisville tonight to begin the season.